Named the "Union Jack" in 1801, the British flag is a combination of England's red cross of St. George, the other red cross represents Ireland's St Patrick and Scotland's white saltire of St. Andrew on a blue background. This complex flag bead, branded with "Swarovski Crystals," is meticulously picked out in red, white, and blue crystals, each placed by hand to create a pavé pattern that reflects light from every angle. 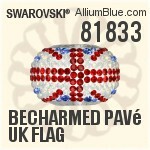 Swarovski 81833 BeCharmed Pavé UK Flag consist of lead-free ADVANCED CRYSTAL by Swarovski.